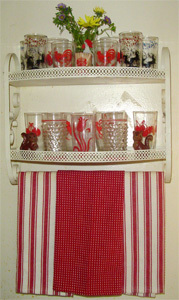 I got the cute shelf for it at Aunt Katie’s Attic in Scotia, NY. I think it was like $12.00 for the shelf. I love it it reminds me of one my grandma had when I was little. Two of my animals S&P’s are on that shelf, one of my newest pairs. Squirrels! I have the rest of my S&P collection on the shelf above my stove. If anyone ever needs a gift idea for me…heehee! I would love to add to my collection! I would also love another one of those shelves! I wish everyone a wonderful weekend! Do something fun! Hey girl, cute collections! Do you plan to keep each collection to a manageable amount and keep them on shelves, and when the shelf space is full, will you stop…or just keep buying more shelves to keep up with your growing collections? I am a book ‘collector’, and have 2 barrister bookcases. I have set myself a limit of filling the two book cases. I weed out once a year. But then again, i am older than you, and am starting to downsize. You, however, are still on the upswing…lol.